Enjoy the sparkle of romance within each bezel of this full diamond eternity ring. Featuring 1 carat of dazzling white round brilliant cut diamonds styled with a sweeping effect across a 3mm band. Experience the sparkle from this 1 carat full Diamond Eternity Ring, elegantly styled with Round Brilliant cut Diamonds. 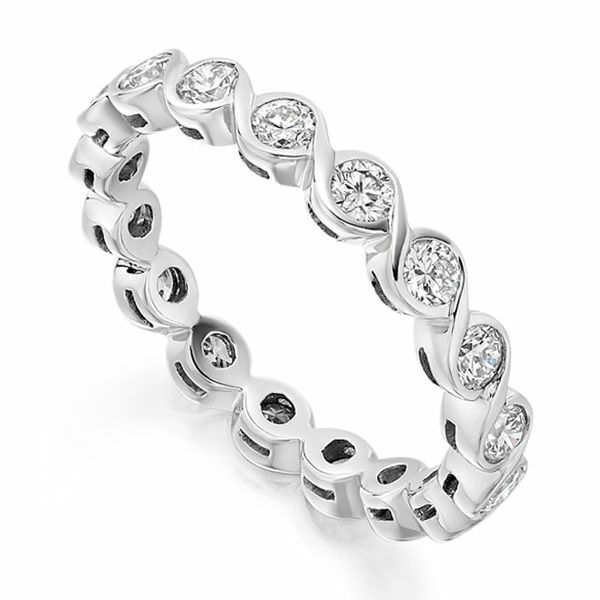 Beautifully matched, each Diamond is held within a flowing full-bezel eternity ring design. Available in a wide choice of precious metals, select from 18ct White Gold, 18ct Yellow Gold, 18ct Rose Gold, 950 Palladium and 950 Platinum. Measuring 3mm wide, each bezel overlaps in a sweeping arrangement, adding a flair of style and elegance to the design. As part of an extensive range of Raphael Collection Eternity Rings, this is just one full Diamond Eternity Ring from our collection. Please allow 4 weeks for this ring to be precision crafted. We send your completed ring, elegantly presented in Serendipity Diamonds packaging, with presentation box—arriving by secure courier. We offer worldwide shipping from our UK showroom, to many countries including Ireland, Europe, Canada, Australia and USA. Please contact us for additional help and guidance on any of our diamond eternity rings. Service rating : Excellent service. It was a pleasant experience and also good value. One local jeweller said that he would not make the required ring (he did not like complete eternity rings) whilst a second wanted 50% more for the same quality item.